amazing group of people He brought to our office on the "Day Of Caring." There were eleven volunteers from our local Arkansas, Oklahoma Gas Corp. They worked hard and accomplished a lot. We are pleased that we can see out our windows and our freshly painted walls look great too. Our other exciting news is that we will be having a fundraiser, “Rhythm of Change” at Sweet Bay, by the park, June 14th at 6:00 p.m. Don Bailey and Friends will be performing, there will also be a special guest speaker that evening who will be sharing their testimony and Karaoke will follow from 7:30-8:30. We hope you will consider purchasing a ticket ($10.00 each) and will make plans to attend. If you are interested in being a sponsor for this fundraiser, just e-mail us and we will get that information to you. The third exciting news is that our annual picnic will be June 23rd from 11:00-2:00. 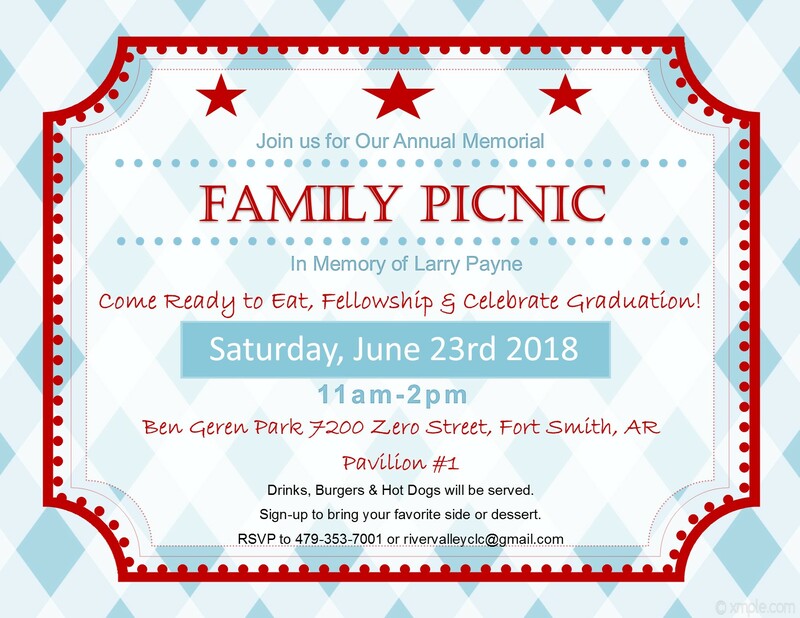 Many of you know that this event is dear to my heart as this is in memory of my husband, Larry Payne. I am including this information below. Our participants need your prayers along with our volunteers and board members. Jobs, housing, family restoration, and health issues are our greatest needs. Always needing more mentors. Thank you for being supportive of this ministry.